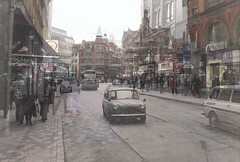 Addendum: Below is the above shot from 1907, in a coloured version. Same angle. Lots of life on the street. No-one choking on car exhaust or diving to safety from vehicles. 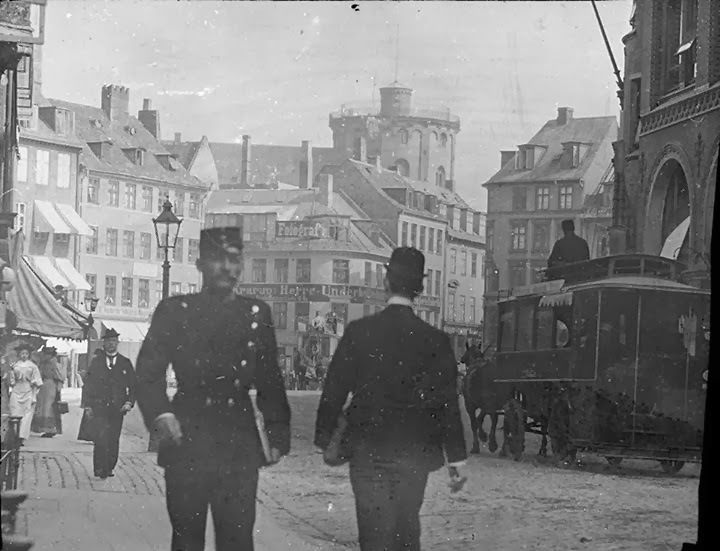 From the FB group Gamle København. 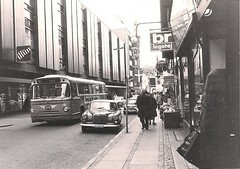 My heart leapt a little when I discovered a series of photographs taken by a Copenhagener, Finn Lustrup, back in 1973. 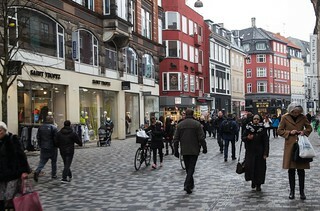 This series is of Købmagergade - one of the two main pedestrian streets in the heart of the Danish capital. Finn Lustrup, born in Copenhagen in 1951, has a fantastic archive of photo material from the streets of Copenhagen throughout a long period of time. I asked him some questions about why he ended up with his brilliant archive. 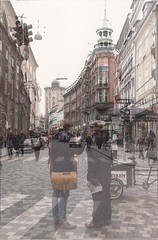 "My interest for photography started in 1965, when I recieved a photo album as a confirmation gift. I borrowed cameras until I bought my own in 1972 and my photography really took off. 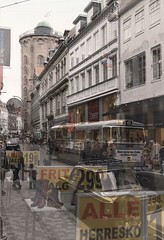 I was there when the #5 tram line was removed and it was then I really started taking photos. 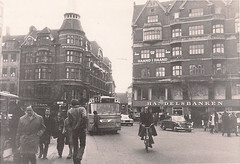 When the tramway network was removed, I focused on buses, but not just the vehicle. It had to be in a street scene because I wanted to record the typical street of the time, since I was equally interested in urban development. 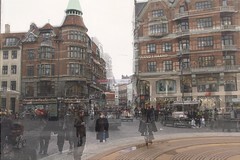 Between 1972 and 1990 I must have taken a couple thousand photos all over Copenhagen and the surrounding area, and often in places where some sort of urban development was underway. Preferably before, during and after. I believe I have filled a gap in the urban development of the city because when the trams disappeared, everyone who was photographing them did, too. So I was rather alone with my camera at that time. 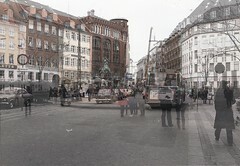 I moved to Veksø in 1984 and took far fewer photos of Copenhagen. I have, however, followed the development of Veksø from a small, unknown town to a larger urban area and, with a co-author, I've published a book about the development of Veksø. I still photograph regularly". 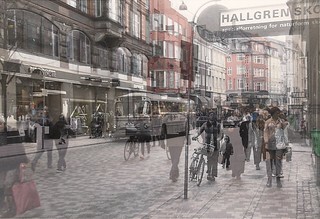 Much has been written about the main pedestrian street - Strøget - which turned 50 last year. 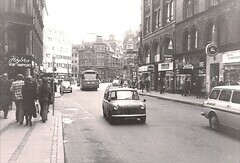 The idea of pedestrianising that street is nothing new. It has been around since - at least - 1913. 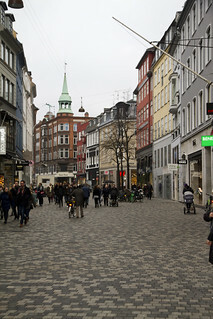 After the planners at the City of Copenhagen took the visionary step of pedestrianising the main thoroughfare through the city centre, the idea started to snowball. 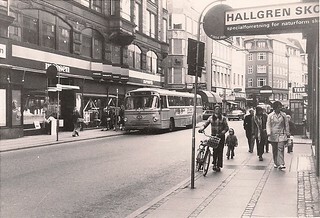 Købmagergade, running north-south from the busiest train station in the nation - Nørreport - took longer to be transformed, as the photos from 1973 will attest. We haven't seen any decent photo documentation of this street's transformation, so we got right on it, thanks to Finn's photo archive. 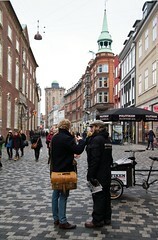 We sent one of Copenhagenize Design Company's über interns - Dennis Steinsiek from Germany, studying at the University of Utrecht - out to take photos from the same locations as Finn was standing in in 1973. Dennis waited a couple of days because of dismal February weather and then couldn't wait any longer for sun. So the photos are from a Wednesday at about noon. 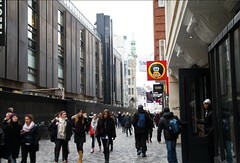 The street is packed from facade to facade on Saturday afternoons, but in these photos there are fewer people at that time of day, in that dull weather. 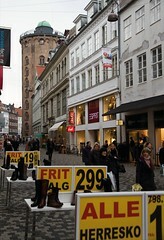 It lets us see more of the street and the transformation, which is why we didn't head out on a Saturday. 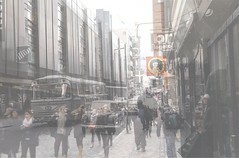 All in all, a wonderful look at how a major thoroughfare has morphed into a truly liveable pedestrian street. 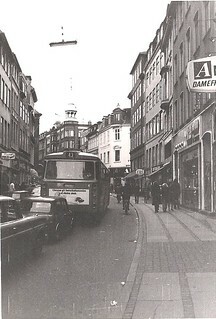 You simply can't imagine buses and cars on this street anymore. 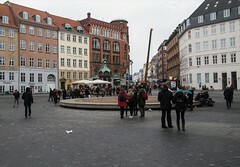 Købmagergade towards Rundetårn - the Round Tower. Looking north. 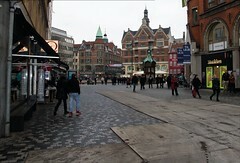 Column at left: Kultorvet looking south. 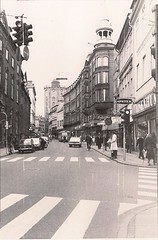 Column at right: Kultorvet looking north. 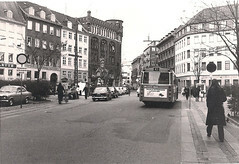 Column at left: Kultorvet looking north. 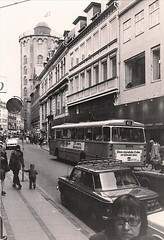 Column at right: Købmagergade by Silkegade & Illum Department store. 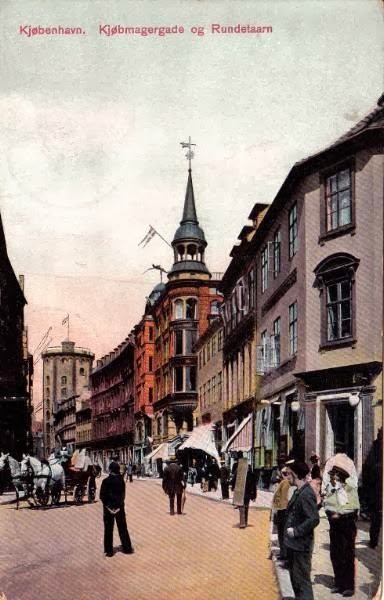 Thanks to Finn Lustrup for his dedication to recording the streets of Copenhagen and for letting us use his photographs as great inspiration.